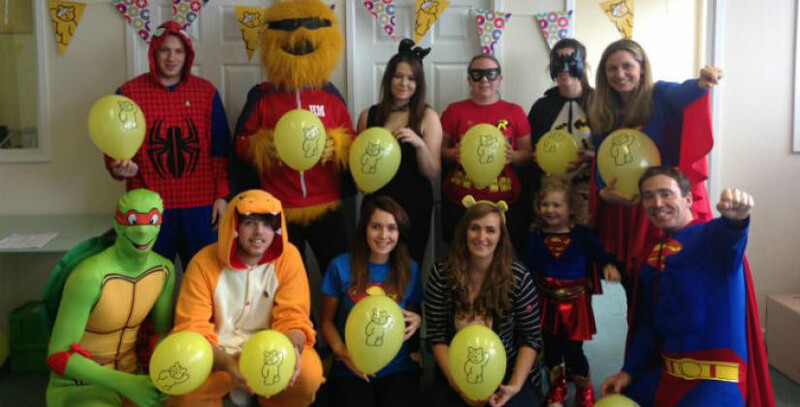 Altrincham Business Centre customer Shoetique raised more than £1,000 for Children In Need with several superhero fundraising activities. A huge congratulations to our Altrincham-based customer, Shoetique for raising an impressive £1,100 for Children In Need. The independent footwear retailer based in Hale, Cheshire held a range of initiatives for its biggest charity event of the year. Embracing Children In Need’s superhero theme for 2014, the Shoetique team donned costumes and collected donations from customers in our Atlantic Business Centre in Altrincham. The company also donated £5 from every order they received on the day, held Facebook competitions to win shopping vouchers and held a bake off competition. Company owners, husband and wife team, Kate and Stuart Conroy, were the judges of the best cake and best superhero outfit contests. A colleague dressed as a Teenage Mutant Ninja Turtle scooped the fancy dress title. Kate and Stuart took over Stuart’s mother’s shop, Shoetique, in Hale, Cheshire and launched the company online in 2009. Two years later and the success of the online store led the Conroys to take up both office space and warehousing with Bizspace. Kate explains: “Stuart has a background in marketing and my experience is in sales, so we combined our skills to create a powerful online presence. We launched online at the right time and the success is growing year on year. "We now have 16 staff based at the Atlantic Business Centre in Altrincham and three staff in the shop in Hale." The business centre has excellent office accommodation and industrial units and gives us the opportunity to grow, as we know we can expand and take up more space if we need it. Shoetique has been rated number one footwear retailer in the UK by independent review site, Trust Pilot. It has also been nominated for a number of prestigious awards in 2014, including Best Footwear Retailer by Drapers and Best Multi-Channel Retailer by Paypal. The company prides itself on offering great customer service and specialises in comfortable footwear, stocking brands such as Hunter, FitFlop and Skechers. If you are looking for workspace to rent in the Altrincham area, the Atlantic Business Centre offers a range of offices, studios, workshops, industrial unit and storage units. Additional support services include a dedicated on-site team, administrative services, reception and free car parking facilities. To find out more please contact Business Centre Manager Jill Scoltock on 0161 926 3600.